Process Classiﬁcation Framework Developed By APQC’s International Benchmarking Clearinghouse In Partnership With Arthur Andersen & Co., SC APQC INTERNATIONAL BENCHMARKING CLEARINGHOUSE... The previous QGEA Business Process Classification framework was adapted from version 2 of APQCs framework. As APQC is now up to version 6, we have created a guide that shows the differences between version 2 and 6 (PDF, 2714.04 KB) of the framework. Description* APQC's Process Classification Framework℠ (PCF), at its simplest level, is a list that organizations use to define work processes comprehensively and without redundancies.... The APQC Process Classification Framework® (PCF Framework) The PCF Framework was developed by APQC, a global resource for benchmarking and best practices, and its member companies as an open standard to facilitate improvement through process management and benchmarking, regardless of industry, size, or geography. 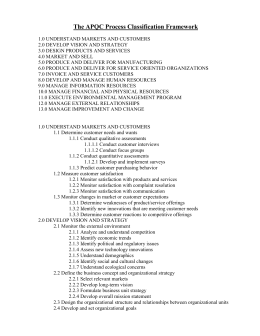 The cross-industry Process Classification Framework was originally envisioned as a taxonomy of business processes and a common language through which APQC member organizations could benchmark their processes.